I’ve hugely enjoyed the first season of American Gods: admired its range and its technical daring, thrilled with its romances, been heartened by its compassion for one-off characters. But under all this pleasure, I’ve felt resistant to the show’s charms, or maybe it’s more precise to say I felt a resistance within the show, an unwillingness to let us in. My expectations were set high by the staggering success of Bryan Fuller’s Hannibal, a psychological thriller reimagined as a nakedly emotional psychosexual drama, which not only has a heart but thrusts that heart, raw and bloody, under our noses at every turn. In its first six episodes, Fuller and Michael Green’s series rivals Hannibal’s wit and audacity, but under all its colorful stories, American Gods has felt shielded. Even as it reveals its characters’ emotional interiors (Shadow’s quiet scrubbing away of his old life, Laura’s suicidal restlessness, Zorya Vechernyaya’s susceptibility to romance), the series has felt distant, as if it’s holding its heart in reserve. Or maybe as if it’s exhibiting emotions rather than embodying them, with the convincing veneer that a good con relies on. There’s plenty of feeling on the surface, but I couldn’t quite figure out where the series’ emotional center resides, where its heart beats—or if it even does. After the sixth episode, I resigned myself to the possibility that, for all its potent imagery and noisy passion, maybe American Gods didn’t have a heart. Then “Prayer For Mad Sweeney” came along to spill out the hidden heart of American Gods on the pavement for all to see. Being familiar with Neil Gaiman’s novel (which I will glancingly discuss, but not spoil, in this review), I never thought the series would make a partnership between Laura Moon and Mad Sweeney its emotional core. 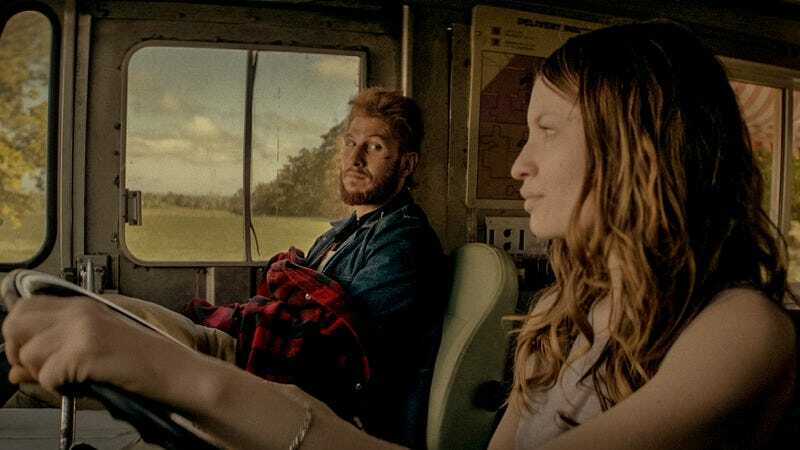 But it has, with admirable success, in part thanks to the volatile chemistry and savage understanding with which Emily Browning and Pablo Schreiber imbue their smallest glances and broadest violence. Their connection is the show’s beating heart, but Laura, as Browning says, is the spleen. Schreiber makes the leprechaun’s hardships and injuries—which multiply as the season goes on, speckling his face with scabs and scars and slashes—as comical as they are vicious. In the first few episodes, Mad Sweeney’s bluster switches from hilarious to menacing in a split second. But in “Prayer For Mad Sweeney,” that already impressive performance expands with the same unsettling speed. The overblown clichés, collected from generations of half-believers, disappear in a flicker of the eye, and Mad Sweeney collapses into the soulful sorrow of a man—a god—lost in a land that can’t believe in him. Even a dead woman walking and a man in love with a jinn find it hard to believe in leprechauns. Mad Sweeney is an outdated superstition turned into a cartoon, and he knows it. Emily Browning gets to show her range, too, reaching beyond the plucky, unpleasant, uncompromising Laura Moon (whose unapologetic air is a delight) to play the equally unapologetic Essie MacGowan (Essie Tregowan in the book). As a convict, transported and indentured in place of execution, Essie makes shift as best she can in a new country. So does Mad Sweeney, whom she invokes in the Americas by laying out milk and bread in supplication as her grandmother (Fionnula Flanagan, looking and sounding like the very soul of Ireland past) did before her. So the fate of Essie MacGowan is bound up with the fate of the leprechaun, who embodies the accumulation of his believers’ most firmly held Irish stereotypes, from the criminal to the comical, from transported convicts of the colonies to the Lucky Charms mascot of the corporate age. By casting Browning as Essie, American Gods gives greater depth to the already powerful connection between Laura and Mad Sweeney and between the actors, who make that connection look as effortless as it is explosive. By the same token, featuring Flanagan both as Essie’s gran and as Essie in old age strikes a graceful note, echoing on a small scale the larger-scale reappearance of Laura-as-Essie. Small staging details also hint at the cyclical nature of Essie’s tale, like the hand-tatted lace that lands her in prison again and the hand-tatted lace canopy over the bed she’ll share with John. This story, and these characters’ fates, are woven together by Essie’s eye for finery and her hunger for freedom—from everyone but the piskies and leprechauns whose favors she seeks. It’s not just that gold coin animating her corpse that ties Mad Sweeney’s journey to Laura Moon’s. The fate of Laura Moon was bound up with Mad Sweeney from the very first episode. “Prayer For Mad Sweeney” confirms that Laura and Robbie’s “accident” was no accident. It was a hit, arranged by Wednesday (judging by the ravens that hector the leprechaun at a roadside attraction) and carried out by Mad Sweeney, designed to unfetter Shadow Moon from his last earthly tie and free him to ride with a god and a con artist. It’s far from the first revelation that Wednesday will double-deal the people he implores to trust him, but it’s the most unsettling so far. When the crash disgorges that coveted coin from Laura’s chest, Mad Sweeney has what he wants. He’s free, free to take back his luck, free to leave her corpse once again sprawled on a road. But this episode shows how tightly bound he and Laura Moon are and have been, even before there was a Laura Moon. His reluctant decision to give her back the animating coin is more than necessary to the plot; it’s necessary to whatever remains of his soul, to whatever it is gods have in place of humanity. “Prayer For Mad Sweeney” is the cleverest and the most emotionally resonant reinvention of a vignette from the novel. It’s affecting, it’s suspenseful, it’s inventive, and it deepens the relationship between two core characters. I find myself wishing the series would extend similar treatment to other characters. Bilquis, Mr. Nancy, Ibis, Jacquel: They all deserve as much humanizing depth as Mad Sweeney and Laura Moon. With one episode left in this season, and at least one more old god to be introduced, we’ll likely have to wait to see if season two does them justice. “Prayer For Mad Sweeney” likely refers to A Prayer For Owen Meany, but I can’t identify a connection between the stories. Theories in the comments! Salim heading straight to House On The Rock probably means the show—and we—get there faster, too. I linked to it above, but don’t miss Esther Zuckerman’s essay on the compelling complexities of Laura Moon.